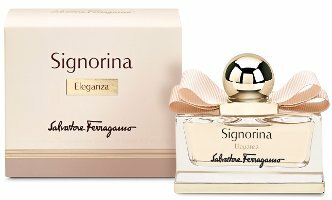 Salvatore Ferragamo will launch Signorina Eleganza, a new floriental chypre fragrance for women. Signorina Eleganza is a "more sophisticated, elegant and luxurious interpretation" of 2012's Signorina. Signorina Eleganza was developed by perfumer Sophie Labbé, who also worked on the original Signorina. The notes include grapefruit, pear, osmanthus, almond, patchouli and white leather. I will update with sizes and concentration when I can; look for Signorina Eleganza in 2014. Update: Ferragamo Signorina Eleganza will be available in 30, 50 and 100 ml Eau de Parfum; look for it in February. Pears and bows, no thanks. I’ll give it a shot in case it turns out to be more elegant than Signorina, but can’t say I loved Signorina. Just when I was starting to think I’m getting old for these new “creations” – or focus group spews whatever – when it looks like leather may be slowly becoming the new pink pepper. Never liked any of the Signorinas, in fact I wonder why I bother with Ferragamo, it must have done at least one fragrance right in the past 15 years, but which one? I’ll give this one a sniff to check how they did the “white” leather. What is “white leather”? Toned down not to upset the floral-fruity group I suppose, since it’s probably not a competitor for Bottega or Kelly Caleche. The notes sound odd though. Guessing white leather is used in about the same way suede is in lists of notes…just to indicate soft, relatively clean leather notes.